here is an aerial view of the development of the York Street dual carriageway. I have highlighted some of the points of interest . Not all of the demolition is finished yet in this picture. A This is Chapel Street. Where the light coloured van is is about where the Dover Express printing shed was. B Last Lane. 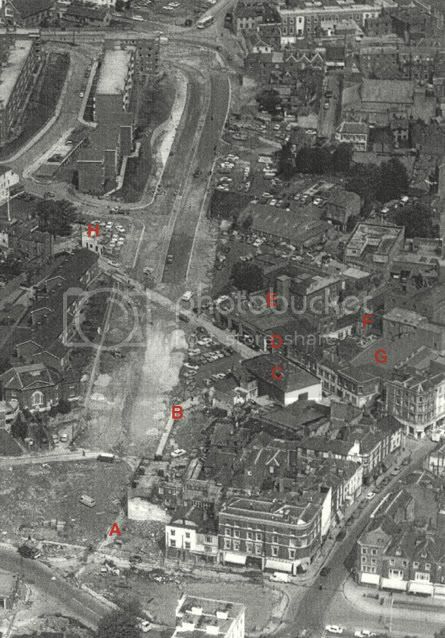 Where the first parked cars are above B is about where the Criterion Inn stood. C Queens Hall in Last Lane and Queens Street. formerly built as a chapel. D Mercers garage,they had just the first bay. E. Warren and Reynolds with loading bays in Queen Street. 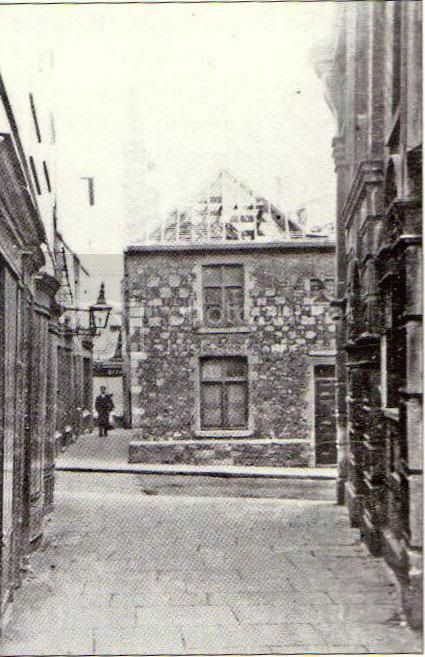 F. The Prince Regent PH next to Market Lane that led through to Queen St and Last Lane. G. The Market Hall, main entrance in Market Sq. and rear entrance in Queen St next to Gaol Lane. H. The Cause is Altered PH being demolished. 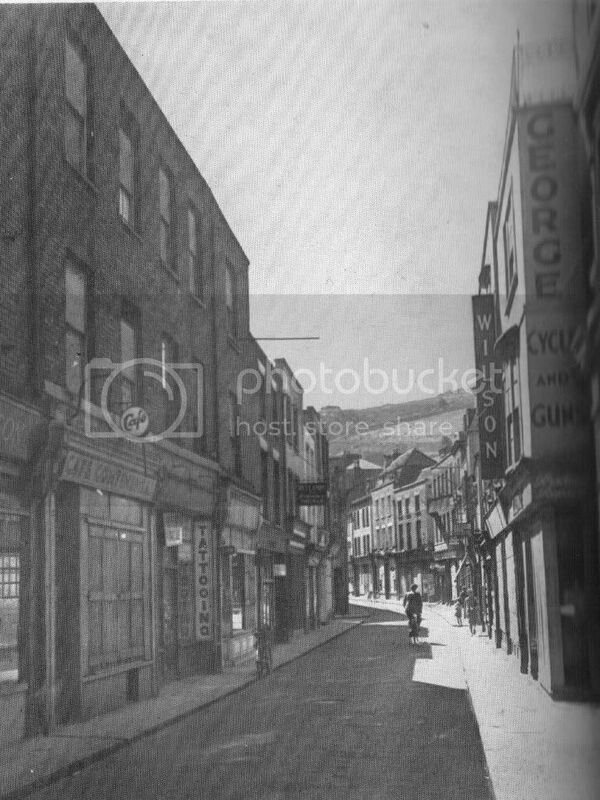 The George shop in Snargate Street in 1943.For readers not familiar with the area,the ditch from the Drop Redoubt to the cliff edge can be seen on the hill behind. Yes thanks delboy,that photo has lost me too.Pity it wasn't taken further back in the Lane so we could see the pub and shop opposite.I might recognize the Lane then.Interesting link which had me thinking of a pub my brothers used.You probably remember it delboy as i think it was at the top of Queen St.Was it the "Cause is Altered"?Photo of it somewhere on the internet. Some very interesting info,Mercers and George were well known in that era.I'm trying to place delboy's photo.Was it taken in Last Lane as the lane across the road is narrower than i recall Last Lane as being?Has that building lost it's roof slates? “Established over 250 years ago, and reputed to be the oldest retail shoe business in the country, Messrs Coulthard & Wilson’s, in Pencester Road, Dover is to change hands. Clarks Ltd, of Street, in Somerset, take over the business and premises, towards the end of January,” reported the Dover Express on December 27, 1963. “Founded in Last Lane, by Robert Low, in 1710, the business has a long and complicated history. The firm changed its name for the first time when Mr Law married a Miss Back and established a good trade in the name of Low and Back. “Eventually their foreman, Mr Thomas Fagg, bought the business and built up a very profitable trade. He sold it to his foreman, Mr J. Wells, shortly after the turn of the 18th century. “When Mr Wells died, his widow married Mr George Coulthard, who eventually took the business over, although he found trading very difficult at first. “In 1821, only Freemen of the Town and Port were allowed to run their own businesses. He was summoned and asked to state why he exercised his “trade, mystery or occupation,” not being a Freeman of the Borough. “That difficulty was overcome, however, and, with Mr Archibald Wilson as manager, continued to build up the business until his death in 1854. “Mr T. Fagg Coulthard succeeded his father, and a few years later sold a half share in the business to Mr Wilson. “Some years later, when Mr Coulthard retired, Mr Wilson became the sole proprietor. 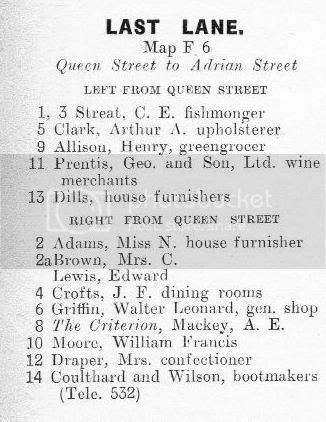 “During the last war, the Last Lane premises were destroyed by enemy action and the firm moved to Pencester Road, where a shop on the corner had been opened in 1863. “The sole surviving proprietor, 94-year-old Charles Wilson, who was born above the Last Lane shop and joined the firm 80 years ago, died on Tuesday,” the report goes on. “It was Mr Wilson who formed the Dover branch of the Boot Trade Association, in 1919. That's some very interesting info.I don't have a Kelly's directory to look back at such info.Warren and Reynolds was a name i was trying to think of.Did A.A. Clark sell 2nd hand furniture as well?I've an idea my parents fitted their rooms out with furniture from a place in Last Lane.That'd be around 1945.That bookshop i can now recall and the stall in the Market Hall.The Criterion pub rings a bell too.I remember one of my workmates who did boxing in the army telling me how he punched some person in that pub and knocked him backwards out through the door!Wasn't the Dover Express offices not far away,as was a cycle shop?Possibly in Snargate Street.I can recall war damage in the area as you say. A quick check of the Dover Express bombs and shells map confirms that this end of Last Lane was hit by a bomb. I came across this street plan i used as an office messenger in the late 1960's.It reminded me of how much of old Dover has gone.Some due to German shells and bombs and some due to early 1970's roadworks for the York Street dual carriageway.Ellenkate has a photo on KHF of those excavations.Last Lane was an interesting little lane and i can recall an antiques shop there with trays full of all sorts things like badges,buttons and medals.Across from it i think there was a pub.Across the road in Queen Street there may have been a food wholesalers with a loading bay serving lorries painted grey with a red stripe(that's what my memory's turned out anyway).Also nearby was the rear entrance to the old Market Hall. Anyone else got memories of this bit of Dover?Some bits of the lanes etc still remain.